Early in their career, the band was known for fast, hard music based in heavily distorted guitars, prominent lead guitar lines, and frequent changes in complex time signatures." 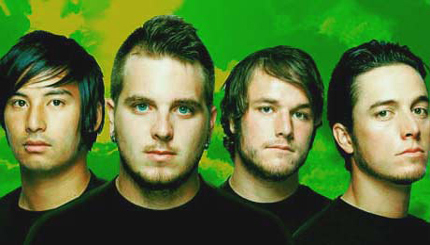 This style is exemplified on their second album, The Illusion of Safety (2002) and their third album The Artist in the Ambulance (2003). Their fourth album Vheissu (2005) made significant changes by incorporating electronic beats, keyboards, and more mature and nuanced songwriting. Their fifth effort was a quadruple album entitled The Alchemy Index (2007/2008), released as two sets of two CDs that together make a 4-part, 24-song cycle. Each of the four 6-song EPs of the Alchemy Index features significantly different styles, based on different aspects of the band's musical aesthetic which reflect the elemental themes of fire, water, air and earth, both lyrically and musically. The band's sixth album, entitled Beggars, was released on August 11, 2009. Each album released by Thrice has had a portion of its sales proceeds donated to a new charitable organization.